Proprietary Name: Labetalol Hydrochloride What is the Proprietary Name? Non-Proprietary Name: Labetalol Hydrochloride What is the Non-Proprietary Name? Labetalol Hydrochloride with NDC 70518-1887 is a a human prescription drug product labeled by Remedyrepack Inc.. The generic name of Labetalol Hydrochloride is labetalol hydrochloride. The product's dosage form is tablet, film coated and is administered via oral form. Dosage Form: Tablet, Film Coated - A solid dosage form that contains medicinal substances with or without suitable diluents and is coated with a thin layer of a water-insoluble or water-soluble polymer. FDA Application Number: NDA018716 What is the FDA Application Number? Start Marketing Date: 02-20-2019 What is the Start Marketing Date? 1-adrenergic and nonselective beta-adrenergic receptor blocking actions in a single substance. 3∙HCl and a molecular weight of 364.9. It has two asymmetric centers and therefore exists as a molecular complex of two diastereoisomeric pairs. Dilevalol, the R,R´ stereoisomer, makes up 25% of racemic labetalol. Labetalol HCl is a white or off-white crystalline powder, soluble in water.Labetalol Hydrochloride Tablets contain 100 mg, 200 mg, or 300 mg of labetalol HCl and are taken orally. The tablets also contain the inactive ingredients corn starch, FD&C Yellow No. 6 (100-mg and 300-mg tablets only), hydroxypropyl methylcellulose, lactose, magnesium stearate, pregelatinized corn starch, sodium benzoate (200-mg tablet only), talc (100-mg tablet only), and titanium dioxide. 1-agonist (ISA) activity detected. In animals, at doses greater than those required for alpha- or beta-adrenergic blockade, a membrane stabilizing effect has been demonstrated. 2-receptor blockade was demonstrated by inhibition of the isoproterenol-induced fall in diastolic blood pressure. Both the alpha- and beta-blocking actions of orally administered labetalol HCl contribute to a decrease in blood pressure in hypertensive patients. Labetalol HCl consistently, in dose-related fashion, blunted increases in exercise-induced blood pressure and heart rate, and in their double product. The pulmonary circulation during exercise was not affected by labetalol HCl dosing. DOSAGE AND ADMINISTRATION). Symptomatic postural hypotension is most likely to occur 2 to 4 hours after a dose, especially following the use of large initial doses or upon large changes in dose. 2-adrenergic blockade results in passive bronchial constriction by interfering with endogenous adrenergic bronchodilator activity in patients subject to bronchospasm, and it may also interfere with exogenous bronchodilators in such patients. Labetalol HCl is completely absorbed from the gastrointestinal tract with peak plasma levels occurring 1 to 2 hours after oral administration. The relative bioavailability of labetalol HCl tablets compared to an oral solution is 100%. The absolute bioavailability (fraction of drug reaching systemic circulation) of labetalol when compared to an IV infusion is 25%; this is due to extensive "first-pass" metabolism. Despite "first-pass" metabolism, there is a linear relationship between oral doses of 100 mg to 3,000 mg and peak plasma levels. The absolute bioavailability of labetalol is increased when administered with food.The plasma half-life of labetalol following oral administration is about 6 to 8 hours. Steady-state plasma levels of labetalol during repetitive dosing are reached by about the third day of dosing. In patients with decreased hepatic or renal function, the elimination half-life of labetalol is not altered; however, the relative bioavailability in hepatically impaired patients is increased due to decreased "first-pass" metabolism.The metabolism of labetalol is mainly through conjugation to glucuronide metabolites. These metabolites are present in plasma and are excreted in the urine and, via the bile, into the feces. Approximately 55% to 60% of a dose appears in the urine as conjugates or unchanged labetalol within the first 24 hours of dosing.Labetalol has been shown to cross the placental barrier in humans. Only negligible amounts of the drug crossed the blood-brain barrier in animal studies. Labetalol is approximately 50% protein bound. Neither hemodialysis nor peritoneal dialysis removes a significant amount of labetalol HCl from the general circulation (<1%). twice daily, elderly patients will generally require lower maintenance dosages than nonelderly patients. As in the general population, some elderly patients (60 years of age and older) have experienced orthostatic hypotension, dizziness, or lightheadedness during treatment with labetalol. Because elderly patients are generally more likely than younger patients to experience orthostatic symptoms, they should be cautioned about the possibility of such side effects during treatment with labetalol. Labetalol Hydrochloride Tablets are indicated in the management of hypertension. Labetalol Hydrochloride Tablets may be used alone or in combination with other antihypertensive agents, especially thiazide and loop diuretics. Beta-blockers, even those with apparent cardioselectivity, should not be used in patients with a history of obstructive airway disease, including asthma. Severe hepatocellular injury, confirmed by rechallenge in at least one case, occurs rarely with labetalol therapy. The hepatic injury is usually reversible, but hepatic necrosis and death have been reported. Injury has occurred after both short- and long-term treatment and may be slowly progressive despite minimal symptomatology. Similar hepatic events have been reported with a related research compound, dilevalol HCl, including two deaths. Dilevalol HCl is one of the four isomers of labetalol HCl. Thus, for patients taking labetalol, periodic determination of suitable hepatic laboratory tests would be appropriate. Appropriate laboratory testing should be done at the first symptom/sign of liver dysfunction (e.g., pruritus, dark urine, persistent anorexia, jaundice, right upper quadrant tenderness, or unexplained "flu-like" symptoms). If the patient has laboratory evidence of liver injury or jaundice, labetalol should be stopped and not restarted. Sympathetic stimulation is a vital component supporting circulatory function in congestive heart failure. Beta-blockade carries a potential hazard of further depressing myocardial contractility and precipitating more severe failure. Although beta-blockers should be avoided in overt congestive heart failure, if necessary, labetalol HCl can be used with caution in patients with a history of heart failure who are well compensated. Congestive heart failure has been observed in patients receiving labetalol HCl. Labetalol HCl does not abolish the inotropic action of digitalis on heart muscle. In patients with latent cardiac insufficiency, continued depression of the myocardium with beta-blocking agents over a period of time can, in some cases, lead to cardiac failure. At the first sign or symptom of impending cardiac failure, patients should be fully digitalized and/or be given a diuretic, and the response should be observed closely. If cardiac failure continues despite adequate digitalization and diuretic, therapy with Labetalol Hydrochloride Tablets should be withdrawn (gradually, if possible). abrupt discontinuation of such therapy. When discontinuing chronically administered Labetalol Hydrochloride Tablets, particularly in patients with ischemic heart disease, the dosage should be gradually reduced over a period of 1 to 2 weeks and the patient should be carefully monitored. If angina markedly worsens or acute coronary insufficiency develops, therapy with Labetalol Hydrochloride Tablets should be reinstituted promptly, at least temporarily, and other measures appropriate for the management of unstable angina should be taken. Patients should be warned against interruption or discontinuation of therapy without the physician's advice. Because coronary artery disease is common and may be unrecognized, it may be prudent not to discontinue therapy with Labetalol Hydrochloride Tablets abruptly in patients being treated for hypertension. blockers. Labetalol Hydrochloride Tablets may be used with caution, however, in patients who do not respond to, or cannot tolerate, other antihypertensive agents. It is prudent, if Labetalol Hydrochloride Tablets are used, to use the smallest effective dose, so that inhibition of endogenous or exogenous beta-agonists is minimized. Labetalol HCl has been shown to be effective in lowering blood pressure and relieving symptoms in patients with pheochromocytoma. However, paradoxical hypertensive responses have been reported in a few patients with this tumor; therefore, use caution when administering labetalol HCl to patients with pheochromocytoma. Beta-adrenergic blockade may prevent the appearance of premonitory signs and symptoms (e.g., tachycardia) of acute hypoglycemia. This is especially important with labile diabetics. Beta-blockade also reduces the release of insulin in response to hyperglycemia; it may therefore be necessary to adjust the dose of antidiabetic drugs. Impaired Hepatic Function: Labetalol Hydrochloride Tablets should be used with caution in patients with impaired hepatic function since metabolism of the drug may be diminished. Intraoperative Floppy Iris Syndrome (IFIS) has been observed during cataract surgery in some patients treated with alpha-1 blockers (labetalol is an alpha/beta blocker). This variant of small pupil syndrome is characterized by the combination of a flaccid iris that billows in response to intraoperative irrigation currents, progressive intraoperative miosis despite preoperative dilation with standard mydriatic drugs, and potential prolapse of the iris toward the phacoemulsification incisions. The patient's ophthalmologist should be prepared for possible modifications to the surgical technique, such as the utilization of iris hooks, iris dilator rings, or viscoelastic substances. There does not appear to be a benefit of stopping alpha-1 blocker therapy prior to cataract surgery. As with any new drug given over prolonged periods, laboratory parameters should be observed over regular intervals. In patients with concomitant illnesses, such as impaired renal function, appropriate tests should be done to monitor these conditions. In one survey, 2.3% of patients taking labetalol HCl in combination with tricyclic antidepressants experienced tremor, as compared to 0.7% reported to occur with labetalol HCl alone. The contribution of each of the treatments to this adverse reaction is unknown, but the possibility of a drug interaction cannot be excluded.Drugs possessing beta-blocking properties can blunt the bronchodilator effect of beta-receptor agonist drugs in patients with bronchospasm; therefore, doses greater than the normal antiasthmatic dose of beta-agonist bronchodilator drugs may be required.Cimetidine has been shown to increase the bioavailability of labetalol HCl. Since this could be explained either by enhanced absorption or by an alteration of hepatic metabolism of labetalol HCl, special care should be used in establishing the dose required for blood pressure control in such patients.Synergism has been shown between halothane anesthesia and intravenously administered labetalol HCl. During controlled hypotensive anesthesia using labetalol HCl in association with halothane, high concentrations (3% or above) of halothane should not be used because the degree of hypotension will be increased and because of the possibility of a large reduction in cardiac output and an increase in central venous pressure. The anesthesiologist should be informed when a patient is receiving labetalol HCl.Labetalol HCl blunts the reflex tachycardia produced by nitroglycerin without preventing its hypotensive effect. If labetalol HCl is used with nitroglycerin in patients with angina pectoris, additional antihypertensive effects may occur.Care should be taken if labetalol is used concomitantly with calcium antagonists of the verapamil type.Both digitalis glycosides and beta-blockers slow atrioventricular conduction and decrease heart rate. Concomitant use can increase the risk of bradycardia. While taking beta-blockers, patients with a history of severe anaphylactic reaction to a variety of allergens may be more reactive to repeated challenge, either accidental, diagnostic, or therapeutic. Such patients may be unresponsive to the usual doses of epinephrine used to treat allergic reaction. J Chromatogr 385:241,1987) should be employed in determining levels of catecholamines. ® A (thin-layer chromatographic assay) and EMIT-d.a.u. ® (radioenzymatic assay). When patients being treated with labetalol have a positive urine test for amphetamine using these techniques, confirmation should be made by using more specific methods, such as a gas chromatographic-mass spectrometer technique. Long-term oral dosing studies with labetalol HCl for 18 months in mice and for 2 years in rats showed no evidence of carcinogenesis. Studies with labetalol HCl using dominant lethal assays in rats and mice and exposing microorganisms according to modified Ames tests showed no evidence of mutagenesis. Teratogenic studies were performed with labetalol in rats and rabbits at oral doses up to approximately six and four times the maximum recommended human dose (MRHD), respectively. No reproducible evidence of fetal malformations was observed. Increased fetal resorptions were seen in both species at doses approximating the MRHD. A teratology study performed with labetalol in rabbits at IV doses up to 1.7 times the MRHD revealed no evidence of drug-related harm to the fetus. There are no adequate and well-controlled studies in pregnant women. Labetalol should be used during pregnancy only if the potential benefit justifies the potential risk to the fetus. Hypotension, bradycardia, hypoglycemia, and respiratory depression have been reported in infants of mothers who were treated with labetalol HCl for hypertension during pregnancy. Oral administration of labetalol to rats during late gestation through weaning at doses of two to four times the MRHD caused a decrease in neonatal survival. Labetalol HCl given to pregnant women with hypertension did not appear to affect the usual course of labor and delivery. Small amounts of labetalol (approximately 0.004% of the maternal dose) are excreted in human milk. Caution should be exercised when Labetalol Hydrochloride Tablets are administered to a nursing woman. Number of patients522181606608503117411242175Dizziness (%)23335191316Fatigue2144537610Nausea<10124071119Vomiting00<1<1<10123Dyspepsia102110224Paresthesia202211255Nasal stuffiness112222456Ejaculation failure021230435Impotence111124343Edema101110122In addition, a number of other less common adverse events have been reported:Body as a Whole: Fever. Cardiovascular: Hypotension, and rarely, syncope, bradycardia, heart block. Central and Peripheral Nervous Systems: Paresthesia, most frequently described as scalp tingling. In most cases, it was mild and transient and usually occurred at the beginning of treatment. Collagen Disorders: Systemic lupus erythematosus, positive antinuclear factor. Liver and Biliary System: Hepatic necrosis, hepatitis, cholestatic jaundice, elevated liver function tests. Musculoskeletal System: Muscle cramps, toxic myopathy. Skin and Appendages: Rashes of various types, such as generalized maculopapular, lichenoid, urticarial, bullous lichen planus, psoriaform, and facial erythema; Peyronie's disease; reversible alopecia. Urinary System: Difficulty in micturition, including acute urinary bladder retention. Hypersensitivity: Rare reports of hypersensitivity (e.g., rash, urticaria, pruritus, angioedema, dyspnea) and anaphylactoid reactions. Following approval for marketing in the United Kingdom, a monitored release survey involving approximately 6,800 patients was conducted for further safety and efficacy evaluation of this product. Results of this survey indicate that the type, severity, and incidence of adverse effects were comparable to those cited above.Potential Adverse Effects: In addition, other adverse effects not listed above have been reported with other beta-adrenergic blocking agents. Central Nervous System: Reversible mental depression progressing to catatonia, an acute reversible syndrome characterized by disorientation for time and place, short-term memory loss, emotional lability, slightly clouded sensorium, and decreased performance on psychometrics. Allergic: Fever combined with aching and sore throat, laryngospasm, respiratory distress. Hematologic: Agranulocytosis, thrombocytopenic or nonthrombocytopenic purpura. Gastrointestinal: Mesenteric artery thrombosis, ischemic colitis. The oculomucocutaneous syndrome associated with the beta-blocker practolol has not been reported with labetalol HCl.Clinical Laboratory Tests: There have been reversible increases of serum transaminases in 4% of patients treated with labetalol HCl and tested and, more rarely, reversible increases in blood urea. Excessive bradycardia—administer atropine or epinephrine. Cardiac failure—administer a digitalis glycoside and a diuretic. Dopamine or dobutamine may also be useful. Hypotension—administer vasopressors, e.g., norepinephrine. There is pharmacologic evidence that norepinephrine may be the drug of choice. 50 in these species is 50 mg/kg to 60 mg/kg. Since the full antihypertensive effect of labetalol HCl is usually seen within the first 1 to 3 hours of the initial dose or dose increment, the assurance of a lack of an exaggerated hypotensive response can be clinically established in the office setting. The antihypertensive effects of continued dosing can be measured at subsequent visits, approximately 12 hours after a dose, to determine whether further titration is necessary.Patients with severe hypertension may require from 1,200 mg to 2,400 mg per day, with or without thiazide diuretics. Should side effects (principally nausea or dizziness) occur with these doses administered twice daily, the same total daily dose administered three times daily may improve tolerability and facilitate further titration. Titration increments should not exceed 200 mg twice daily.When a diuretic is added, an additive antihypertensive effect can be expected. In some cases this may necessitate a labetalol HCl dosage adjustment. As with most antihypertensive drugs, optimal dosages of Labetalol Hydrochloride Tablets are usually lower in patients also receiving a diuretic.When transferring patients from other antihypertensive drugs, Labetalol Hydrochloride Tablets should be introduced as recommended and the dosage of the existing therapy progressively decreased. Labetalol Hydrochloride Tablets, 100 mg, light orange, round, scored, film-coated tablets debossed on one side with “CL 37” and “100”, bottles of 100 (NDC 47781-552-01) and bottles of 500 (NDC 47781-552-05).Labetalol Hydrochloride Tablets, 200 mg, white, round, scored, film-coated tablets debossed on one side with “CL 38” and “200”, bottles of 100 (NDC 47781-553-01) and bottles of 500 (NDC 47781-553-05).Labetalol Hydrochloride Tablets, 300 mg, mid-orange, round, scored, film-coated tablets debossed on one side with “CL 39” and “300”, bottles of 100 (NDC 47781-554-01). 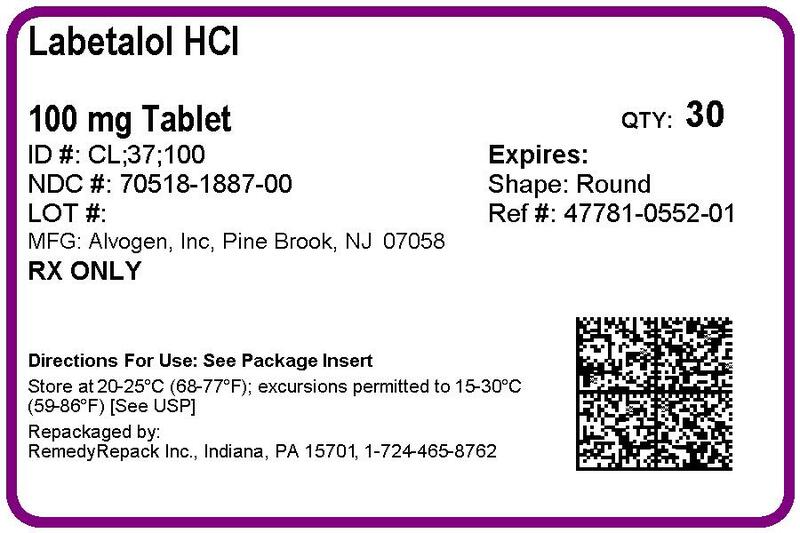 Labetalol Hydrochloride Tablets should be stored between 2° and 30°C (36° and 86°F).